Having dethroned the late King Numedides III and claimed his crown to rest on a troubled brow, Conan of Cimmeria now sits upon the throne of Aquilonia. 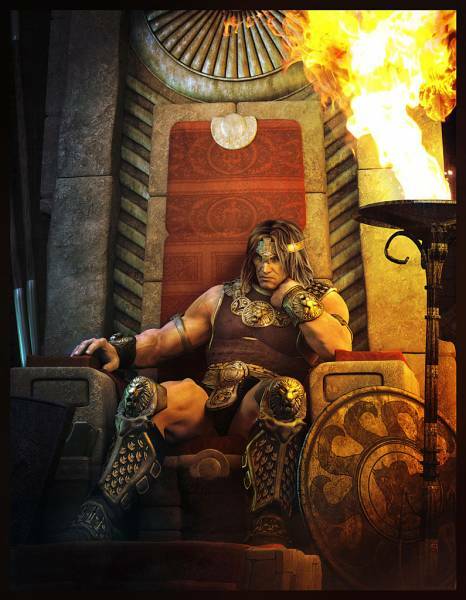 Having dethroned the late King Numedides III and claimed his crown to rest on a troubled brow, Conan of Cimmeria now sits upon the throne of Aquilonia. His tales are known as legend and fable all over Hyboria. Except in the darkest reaches of the Black Kingdoms or the savage tribes of the Pictish Wilderness, there is not a soul who has not at least heard of the life of Conan, and there is not an adventurer whose life does not mirror his own in some way. Conan has lived many lives on his fractious journey to the throne. 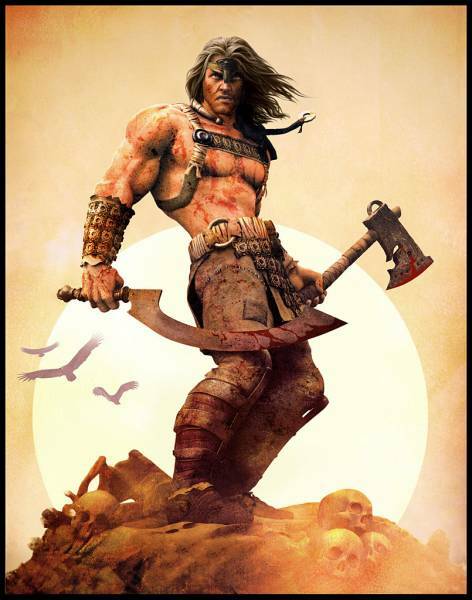 His adventures began in a barbarian clan growing up in the harshness of Cimmeria. Even as a young boy of merely fifteen summers, he had partaken in the sacking of the Aquilonian outpost of Fort Venarium. He enjoyed life as a raider with the Aesir, crossing blades with Vanir and Hyperboreans alike. He bled as a laboring slave and gladiator, a sell-sword and a prisoner. He lived as a thief in the streets of Shadizar, making a living on ill-gotten treasures and "forgotten" coin. 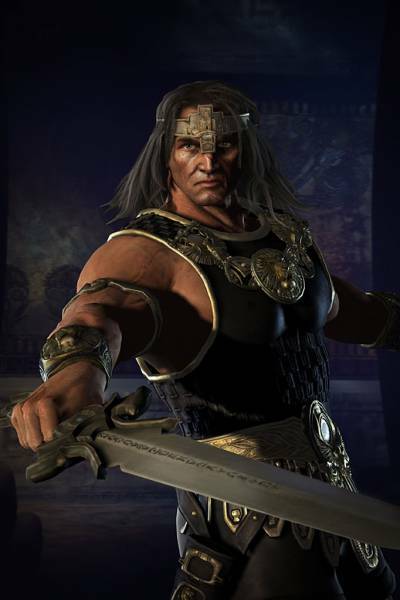 Conan has lived on both sides of the law, as a ship's captain and pirate, as a mercenary and a soldier-and eventually, as king of Aquilonia itself. He has slain beasts, monsters and demons, never sparing their dark, sorcerous masters. His blade has tasted the blood of hundreds, and his travels took him across thousands of leagues. But not all of his adventures were born of blade and blood. He has also loved as fiercely as he has battled. Women from many lands have earned his attentions throughout his travels, some say that few even held his heart for a time-perhaps longer than even Conan would like to admit. No matter his past loves and conquests, it is Zenobia who would share his life and become his wife and Queen. He has led Aquilonia's armies against his kingdom's foes from Nemedia, Ophir and Koth; sending a message that the Border Kingdoms will not be left to their own devices. There has been too much blood spilled in those broken lands to ignore any longer. As king, Conan cannot venture forth as he used to, so he must leave it to his able-bodied and loyal subjects instead. They are enjoying a vagabond's life of travel and excitement day to day behind the hilt of a bloody sword, while he must patiently wait to hear of their successes. His role has become more structured, more bound to Tarantia and the fate of Aquilonia than ever before. The crown has never felt heavier for him. He sits on his throne in Tarantia, watching and waiting tensely as threats to his rule rear back like cobras ready to strike. He would like nothing more than to ride out and meet these enemies in battle as a warrior should, but as king he cannot-leaving it instead to the brave adventurers who follow in his footsteps. Where he has been the source of legends, King Conan enjoys his heralds' tales of heroes from this new age, the inheritors of his own adventures long passed.